Merchandise of strikingly beautiful colored merchandise is sold at the market outside Les Arenes in Arles, France. A street market outside Les Arenes in Arles, France is an excellent place for vendors to set up a stand and display their goods. Les Arenes in the Provence, France in Europe is a historic Roman arena where the sport of bullfighting is the major attraction. 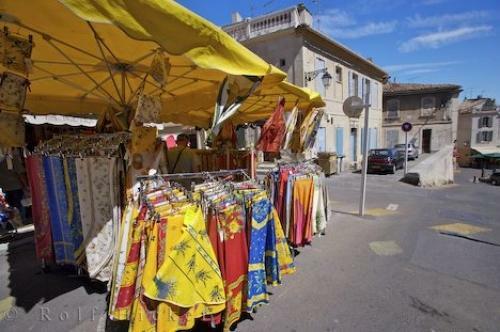 Many tourists visit the Les Arenes in Arles and locals find the market the most efficient way for visitors to get a good look at the assortment of merchandise they have for sale. Market stalls outside Les Arenes in the city of Arles, Bouches du Rhone, Provence, France, Europe. Photo of a street market outside Les Arenes in Arles, France in Europe.